The America’s Cup World Series in Portsmouth is set to be one of the most exciting sporting events ever hosted by the UK, with four days of action-packed racing and entertainment for hundreds of thousands to enjoy. It won’t just be spectators soaking up the great atmosphere, with all the racing off Portsmouth being broadcast to a global audience. Six teams will be battling it out over the weekend including, Land Rover Ben Ainslie Racing, Oracle Team USA, Artemis Racing, SoftBank Team Japan, Emirates Team New Zealand, Groupama Team France. So whether you’re planning to be there or will be watching the action from your sofa, here are all the details you need to know. It’ll be an action packed four days both on and off the Solent, with plenty of racing and entertainment to keep fans interested. The race village will be open from 10am everyday with a number of regular events for spectators to enjoy, including moth racing and kitesurfing displays. 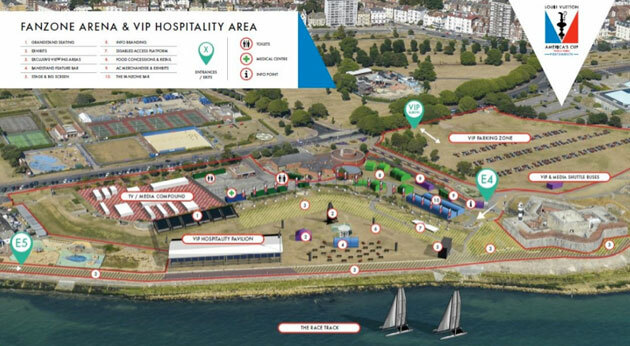 Thursday 23 July: Highlights from the first day of the World Series in Portsmouth include the arrival of the America’s Cup trophy at 11am, the official parade of sail at 12.30pm and a press conference and presentation of skippers in the Fanzone Arena at 3pm. In the evening there’ll be an official opening ceremony at 7pm, followed by a concert featuring The Massed Bands of Her Majesty’s Royal Marines at 8pm. Friday 24 July: On Friday, the Red Arrows will be taking to the skies at 12.10pm for one of their spectacular aerial displays, before the teams take part in a practice session on the Solent between 1.30pm and 3pm. Shortly after the skippers will come ashore, before a media mixed zone with skippers in the Fanzone Arena takes place at 3.30pm. Friday’s evening entertainment kicks off at 7.15pm with a South Coast Proms concert featuring The Massed Bands of Her Majesty’s Royal Marines. Saturday 25 July: Saturday see’s the first big race day, with an RNLI helicopter display at 10.30am and another Red Bull Matador aerial display at midday. The first two official Amercia’s Cup World Series races will take place between 1.30pm and 3pm, before the skippers come ashore at around 3.30pm. Shortly after there will be a Blades aerial display before the pop concert Portsmouth Live! kicks off at 7pm in the Festival Area. Sunday 26 July: The main event on Sunday is a further two races taking place between 1.30pm and 3pm before the gala prizegiving event on the main stage at 4.15pm. This will be followed by a Spitfire aerial display. 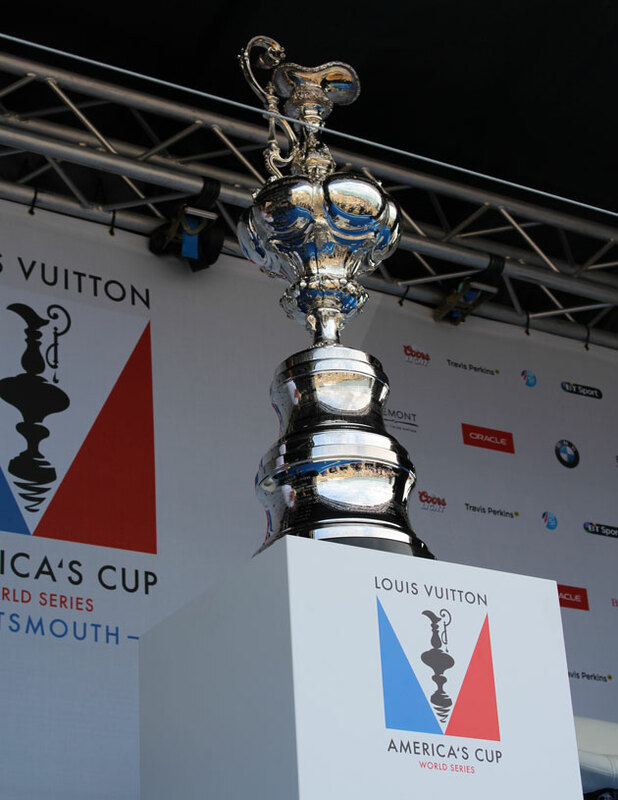 A full schedule of events can be found on the America’s Cup World Series Portsmouth website. 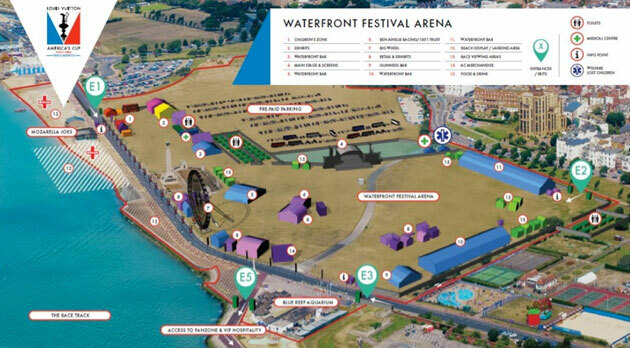 Much of Southsea Common in Portsmouth will be taken over by the event, with ticketed areas providing the best view of the action, according to the organisers. Tickets for the grandstand have already sold out but spectators may be able to purchase tickets for the Fanzone Stage area. The festival part of the site is also a ticketed area, but they are free of charge. There’s a total capacity of 60,000 with more than half of these tickets having gone, so make sure you get in there quick. While the views from the festival site will not be as impressive as elsewhere, there will be large screens with live commentary for fans to watch the action on. 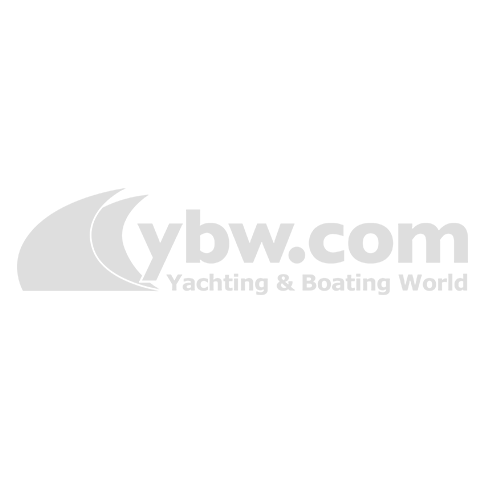 Once all of the racing is complete on Saturday 25 July, Portsmouth Live!, a concert featuring the likes of Spandau Ballet, will be held in the festival area, but you will need to purchase a ticket for this event separately. America’s Cup fans will also be able to watch the action from the comfort of a boat, with two viewing zones for spectators. 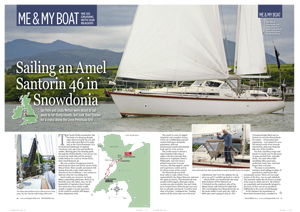 One will be for smaller boats less than 7m LOA, and another main spectator channel on the other side of the race course. There will be an exclusion zone around the race course to ensure there are perfect conditions for the teams racing aboard their AC45s. 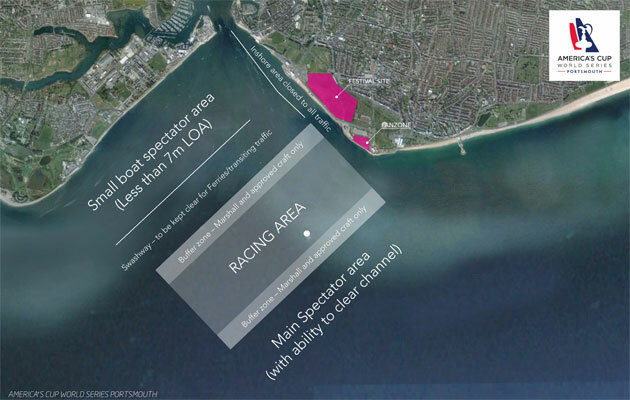 The exclusion zone will be made of official marshals, official event sponsors and team boats. Only boats designated by race management will be able to gain access to this area. You’ll be able to keep up with all the action from the weekend’s racing via TV, radio, online and social media. BT Sport recently acquired the rights to broadcast the World Series and will be showing all live stages of the event, while the BBC will broadcast a highlights programme in the evening. Portsmouth Live! Radio will also be broadcasting from the event on 93.7fm. They’ll be regular updates to the America’s Cup World Series Portsmouth social media channels, and they will also be uploading full results and behind the scenes action to their live blog.